Colt’s Manufacturing has been working hard to relaunch their legendary Cobra series with a new, modern design with all the look and feel of the original. This SHOT Show 2019, Colt showcased their latest and greatest, the new King Cobra chambered for .357 Magnum. 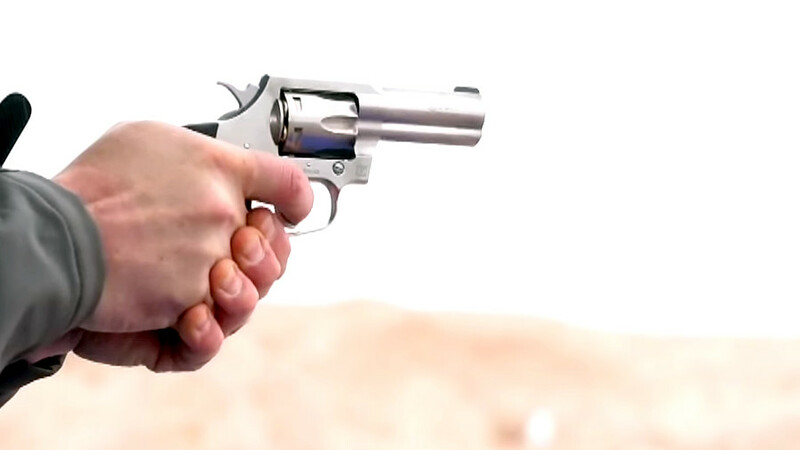 Colt just recently announced the King Cobra, a compact 6-shot revolver chambered for .357 Magnum and this is our first hands-on with it. It features a stainless-steel barrel, a heavy-duty frame and a 3-inch barrel with a full-length underlug. Shooting the King Cobra was pleasant even with .357 loads. The trigger is very smooth and consistent. Until now the Cobra series was made of revolvers chambered for .38 Special. While it’s a popular round for self-defense, especially with modern over-pressure loadings, it doesn’t have the same appeal as the full-power magnum cartridge. Outfitting the King Cobra with a 3-inch barrel is an interesting move on Colt’s part. Even just a few years ago it would have made more sense to lead with a full-size, service-length barrel in the 4-5-inch range. Today service revolvers play a secondary role to those more suited for concealed carry, revovlers with truncated barrels. At 28 ounces unloaded, the King Cobra is light enough to carry all day, and heavy enough to shoot full-house magnum loads. Other features include an exposed hammer, low-profile U-notch rear sight, oversized trigger guard and a Hogue overmolded grip. It has a brushed finish and brass-bead front sight for high visibility and quick target acquisition. The King Cobra is based on the redesigned Cobra and uses the same user-interchangeable front sights and linear leaf spring trigger. The redesigned trigger system delivers a double-action pull in the 7-9-pound range and a light 3-4-pound pull in single-action. The suggested retail price is $899 which is in-line with the higher-end Cobra revolvers and should work out to a street price between $700 and $800. If the return of the Cobra is any indicator of things to come, Colt will be sure to follow it up with other models and configurations. Really, will someone explain what difference it makes which direction the cylinder turns? Good grief! Fvck Colt, S&W and especially Taurus,,,,,If you want an accurate, well made, reliable revolver,,, then you want a Ruger revolver,,, SIMPLE AS THAT…. I can’t figure why anyone would pay 7-800 bucks for a revolver just b/c it says colt cobra on it. the ruger gp 100 is a better looking pistol any way you look at it and it’s 100 + cheaper. the smiths and colts are very great guns but not better than rugers. just to the fan boys it seems. Ruger makes a good durable gun, but their looks are far from good. Smith\’s you could build a house with, as far as durability goes. But colts always carried a special place in my gun safe for me. I never cared which way the cylinder turned..nor would anyone else as far as I can see. It still TURNS..right? MY problem with buying colts TODAY is because how they backed down once they were put on a law suit after the school shooting, they actually PAID to get out of!! The others just used common sense and WON the suit! Secondly they quit selling to the general public right after that..As if saying the anti gunners were RIGHT! That WE didn\’t deserve to own a Colt, like the cops do!! Well, if WE were not good enough for YOU back then..YOUR not good enough for ME now!! I will never buy another one! But then, that\’s just MY OPINION! I agree on your comment, that put a bad taste in my mouth too when they stopped selling, and also to dealers unless you were “a authorized dealer”. Smith’s you could build a house with, as far as durability goes. But colts always carried a special place in my gun safe for me. I never cared which way the cylinder turned..nor would anyone else as far as I can see. It still TURNS..right? Secondly they quit selling to the general public right after that..As if saying the anti gunners were RIGHT! That WE didn’t deserve to own a Colt, like the cops do!! Well, if WE were not good enough for YOU back then..YOUR not good enough for ME now!! I will never buy another one! But then, that’s just MY OPINION! Why does Colt keep dancing around making the guns everyone wants? Pythons and Anacondas! Nobody wants Cobras or King Cobras. It almost seems like Colt wants to fail instead of making a product they will sell everyone they would make. I have both owned and fired extensively the Colt .357, the Troopers Mk3 & 5 and the Python. Of those mentioned here, the Mk III was far and away the best of the lot. The .357 and the Python were delicate and could be found out of timing is as little as a few boxes after being retimed. I had the barrel unscrew right out of the frame on my .357. Have yet to own or fire a Cobra and there is no burning desire on my part to do so. A good friend of mine won King Cobra as a prize in an IPSIG match many years back and blew out the paper thin forcing cone in a very few rounds. I’m sure these newest ones are okay, but I seriously doubt if they’ll hold up like a Smith & Wesson 586 or 686. The Ruger GP 100 is something else again. I originally acquired one for a beater . . . something that I’d put to extremes that I did not want to subject my Smiths to. After shooting it extensively, I must admit I’ve got a keeper. Although I have yet to have a Cobra to compare with, my past experience with Colts leave me to believe that it will not hold up, particularly next to either a Smith or Ruger. It’s no wonder why this company goes bankrupt so often. They don’t listen to it’s customers. Nobody wants a Cobra or King Cobra. They want Pythons and Anacondas. Whoever is running the company needs replaced. Stupid decisions…..
Im waiting for the return of the Python. Oh, I know it wont be the same-all that hand fitting and all. But I’ll buy one anyway-just because. well colt is a good fire arm. and python was a good fire arm and diamondback and why did they stop making them.? as they were the best guns on the market. also the new one king cobra , 3 ” barrel. well ok i had rather have a 4 ” . but will see if i can find one . as i would like to know where in Va. that sales them. i am a retired police officer. and my colt python was stolen and have not been able to replace it.. so let us know out here where to get. a colt. “Only” $100 more (msrp) than a GP100… I’m sure the difference will be much bigger at the store tho, with Rugers being discounted and the Colt having a much smaller (if any) discount..
Now, if colt would make a 6 round 44 magnum I might pay the extra $$ over a Ruger. Is this the same Colt product that has the cylinder lockup after the hammer drops ? ? Well I see Colt still has a clockwise rotation as opposed to most other revolver manufacturers, have not gotten with the times staying with the SAA rotation of 150 years ago. Looks like a S&W, no vent rib of old, I’ll keep my model 66 and shoot it carried it on duty in LE most agency’s got away from colt because of expense and clockwise rotation. Everyone wants colt to bring back the python and diamond back. Why remake the Cobra and King Cobra? Maybe so colt fan boys buy them and if or when they do bring back the Python /Diamondback the fans boys will trade them in to purchase the what they wanted all along? S&W, Ruger, and Taurus already have that lunch menu well covered, and at a substantially better price. I’d rather be able to walk into a well stocked gun-shop, and buy a brand new COLT SAA New Frontier with a 4.62″ barrel, nickel finished, and chambered in 44 special. That currently isn’t an option with COLT, ie, unless one doesn’t mind waiting for two+ years, and yet another possible bankruptcy, for a revolver order which may never be fulfilled. SPORTING STORE THAT SELL THE COLT 357 MAG. Where the hell is Clay! Couldn’t make it this year. Look at that. Colt’s stopped using [both] hands to flip us off.